Ok here's another. Long ago cartoons were all the rage in newspapers. 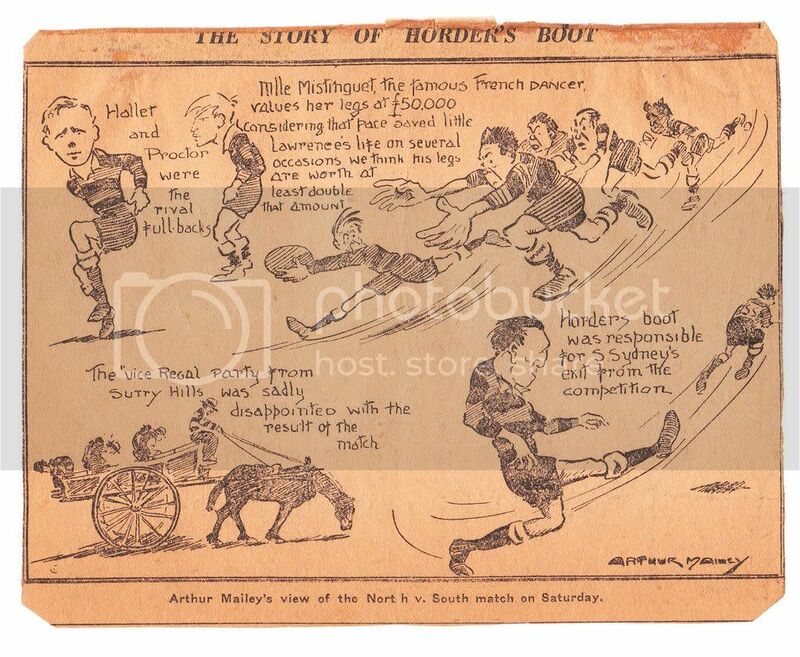 When there was a major footy match a cartoonist such as the famous Arthur Mailey would draw a review of the match. He was famous for his cricket cartoons as well. 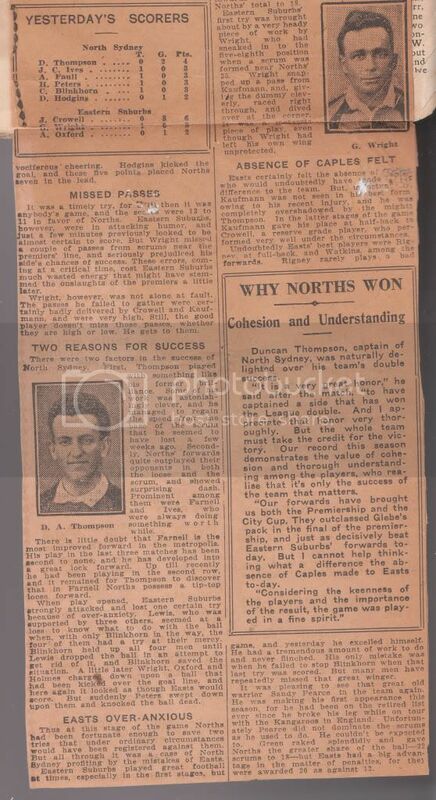 Here is one about Norths kicking Souths out of the City Cup which was a major competition in those days. 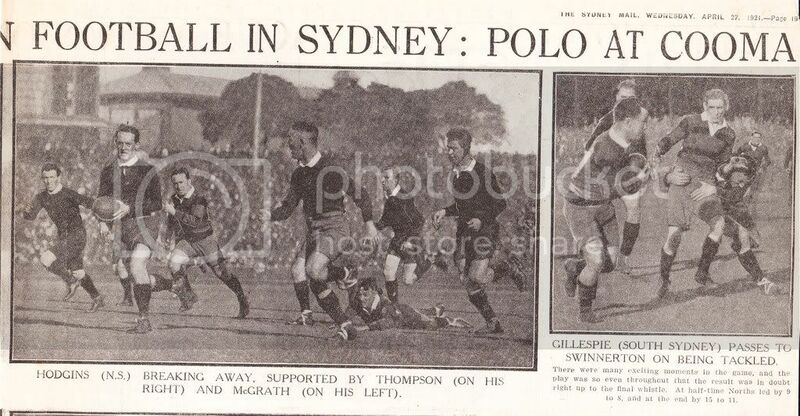 Norths won the 'double' in, I think, 1921.
these are sensational Mark - thanks for sharing them. i envy your collection. i love the 'vice regal' wagon from the slums! Ok let's see if you like this one. This has to be posted in two parts. As a Norths fan no doubt you have seen this from 'True Blue'. As a Souths fan who like old photos, I was dreaming of one day seeing the original of the photo which has Souths v Norths playing. Part 2- ....well anyway I was lucky enough to come across a copy of 'THE DAILY MAIL', an old weekly newspaper that sometimes had articles about rugby league. 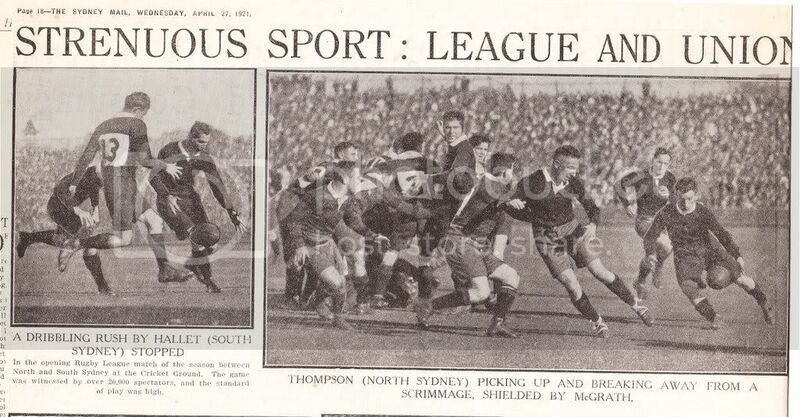 This one came from 1921 and had a large article about rugby league and a double page spread of photos of the match of the day- North Sydney v South Sydney. On this page was the original photo. I post it for you viewing pleasure and if anybody likes it then I will post the others. mate, they are great reads! Ah if you liked that you will like this- it is the famous Norths team on the move in the same game. here's another part of the same magazine. With referance to the photo directly above dated 27th of April 1921..
after quite a bit of searching I am starting, I think, to put a bit of picture to this, and christian names to the faces.. it has been a bit of a search thus far.. but here goes. 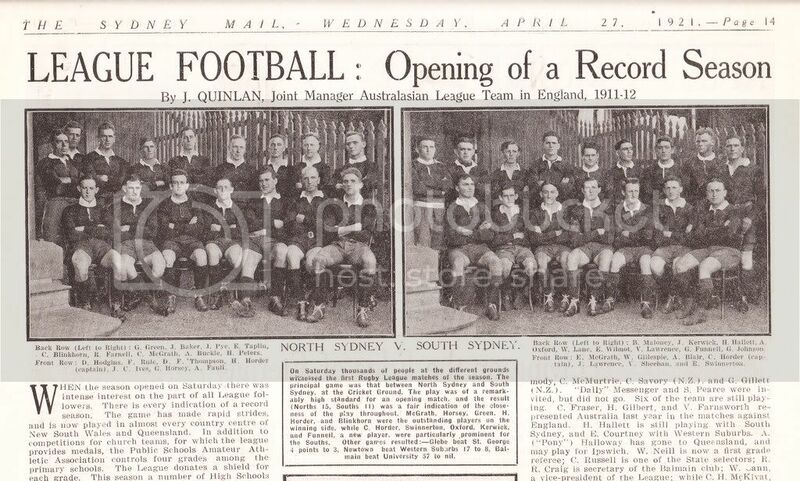 so I'm pretty certain thats the 16 indentified in the photo, I'm also under the impression that this photo was taken on saturday 23 April 1921, as both photos were taken in the same spot maybe taken just before the game?so thats why I think this is a pretty accurate naming of the 21 team. Norm Proctor did play for the Bears for awhile so definitely 1922. .. it is looking likely the photo at the very top of the page from Rugby League News might be the 1922 squad, especially when Horsey is inset, he had already left by '22..
i have is a player called Henry Pidcock, now henry got around a bit..(Annandale 1915-1916:1918-1919:Norths 1920-1921:Balmain 1921-1922:Glebe 1923 -1924) nearly had as many clubs as Phil Blake, so i will have to find out whether he played for us in 21 then moved across to Balmain the same year..might have been a residency rule I wonder..?? 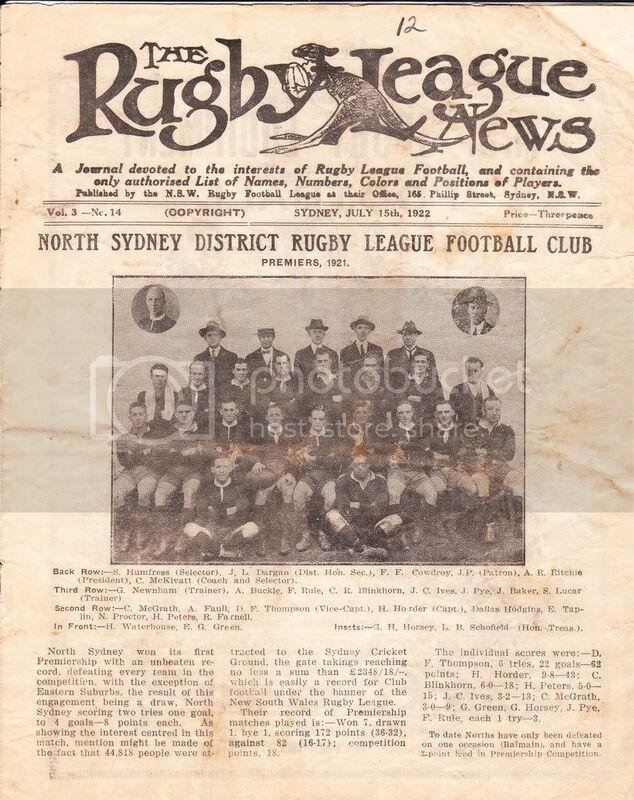 Reg Farnell would have been 30 in this game he come from over randwick way played for Norths 1915-1918 played for Easts 1919 then norths again then player bio says from 22-23 but was obvious in the 21 team photo against souths in round 1 1921.. 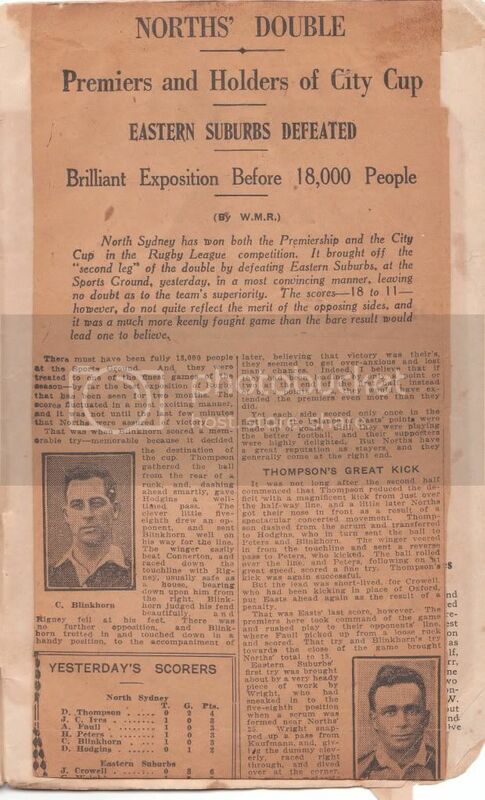 I think it's important we get the info accurate especially when next season marks the 90th anniversary of our 1st premiership..plus I think the city cup victories were in 1920 and 1922.thus the cartoon Hallett and Proctor 1922..
Jimmy Pye actually come from the Annandale club he played a couple of years there before coming to the norths club.the "Dales" folded in 1920 they played a few games at NSO against Norths before the maroon and yellows folded.So much history at bear pk. I have been reading a few items on the forum and there was mention of 'THE REFEREE. This was a great sporting newspaper from the early days. In fact even when other newspapers did not report in any detail league games, especially during WW1 THE REFEREE would. C J Davis was one of the, if not the BEST league writer of all time. Another one from that time was Claude Corbette from THE SUN. Anyway I thought I would post an example from 1921. I got this from a football annual from 1919. 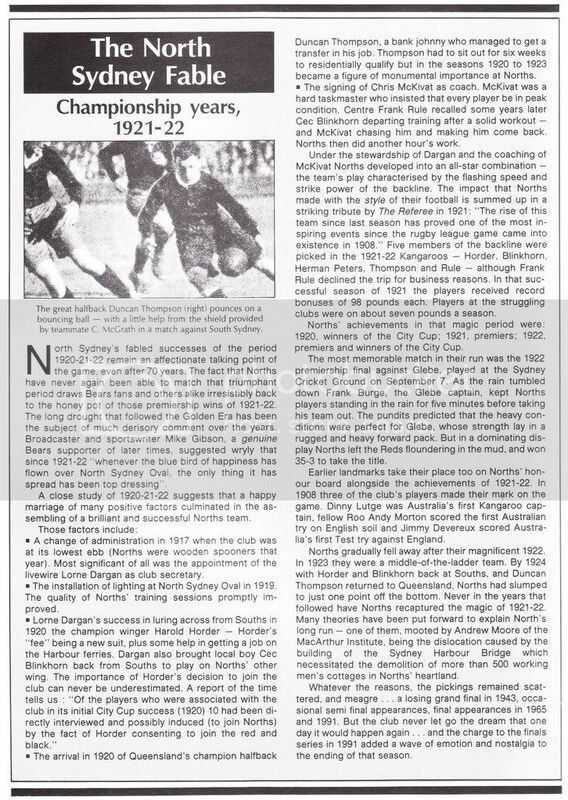 The previous owner was a Norths supporter and had used the book as a scrapbook of Norths articles from 1920-22. This article is about a game, I believe, that was the best moment in Norths history.